Do Any Of These Sound Like Your Decorating Problems? Freezing cold walls or cold spots causing condensation? Walls where the wind has been blowing through the cracks? Condensation issues around bay windows due to a lack of cavity, inadequate coverage of ceiling insulation and airflow problems? Freezing porches and hallways due to single brick? External walls where the temperature is distinctly lower than your other walls? GPS Decorators have a cost effective solution to treat these problems. We have come across a number of projects where we have utilised our knowledge to great effect and where re-papering wouldn’t tackle the problem and simply wouldn’t be professional. In all of theses instances we would always offer our solution of using a thermal liner. What Is Thermal Lining Paper? How Does Thermal Wallpaper Work? It is made from a technologically advanced, thermal insulation material bonded to a high quality lining paper. Wallrock Thermal Liner creates a warm blanket for your walls and ceilings which significantly reduces room warm up time, stops heat escaping through walls and ceilings, minimises condensation, mould and damp and reduces your energy bills, too. Because it is so thick (3.2mm) it also provides a substantial amount of sound insulation, reducing noise by up to 35%. In addition, it covers up rough or damaged walls to transform them into a flat finish. The most effective place to add any thermal barrier is on the inside of the coldest walls. It is especially effective on external walls by which we mean walls that are open to the elements on the other side. When a room has been lined with Wallrock Thermal Liner it reduces both the cooling effect of the wall and cold air currents in the room created by the differential temperature zones within a room. Rooms become warm and cosy up to 65% more quickly and energy consumption is reduced by up to 35%. Any room will benefit from the use of thermal liner. The biggest benefits however are in older houses with solid wall construction. The high level of elasticity in the flexible fibres and 3.2mm thickness of the paper covers cracks exceptionally well. Wallrock Thermal Liner also provides excellent coverage of slight to medium textured base surfaces without pre-levelling. Mould is not only unsightly but is unhealthy too and is often blamed for allergy and other medical problems. Walls that have a surface temperature which is distinctly cooler than the ambient room temperature allow condensation to form. As a result it creates an ideal breeding ground for unhealthy mould formation. This is why the problem is often seen on outside walls and close to windows. The warm and moist room air condenses on the cooler areas of the walls and creates condensation. Permeable Wallrock Thermal Linerim is the solution to walls with this kind of problem. It increases the surface temperature of the wall, prevents condensation and therefore combats mould formation. While the thermal liner supplies a superb surface for paint, we always finish it with the use of non woven lining paper over the top for a totally flawless finish. Compatible with period features in older properties. 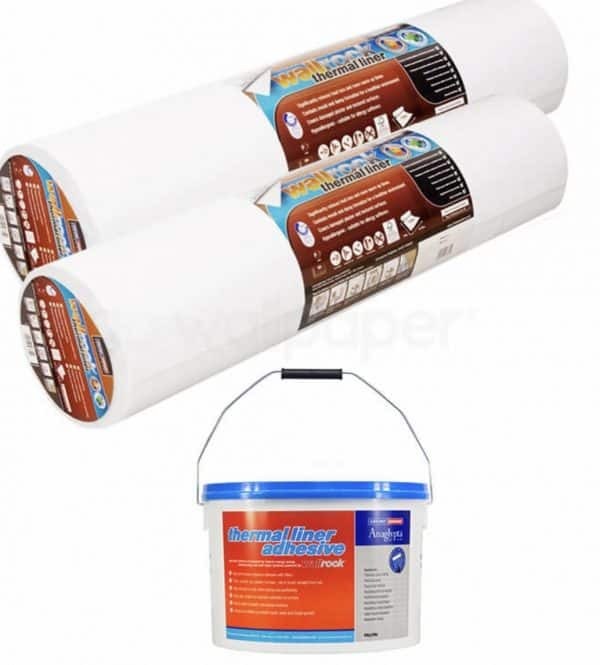 Important: If you are planning to hang lining paper or wallpaper on top of a thermal liner we strongly recommend that you use a non woven lining paper such as Wallrock Fibreliner. Traditional lining paper shrinks and expands when pasted and can cause lifting on the joints. In contrast, non woven lining paper is dimensionally stable and ensures a perfect finish. Sound like a mammoth decorating task? Call for our team of highly skilled decorators. Get in touch to see how professionally GPS Decorators can rise to the challenge of helping you insulate and protect your home. We cover the whole of the North East including locally across Teesside; Stockton, Middlesbrough, Wynyard, Darlington, Redcar, Stokesley, Nunthorpe, Yarm and all surrounding areas.